I have to say the whole Alcatraz Series very very interesting read. 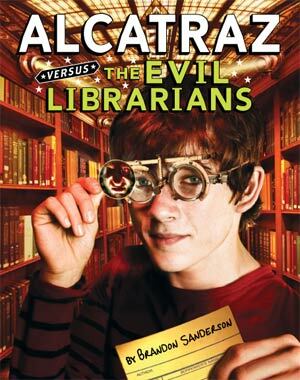 But for right now I’m just going to talk about book 1 Alcatraz Versus the Evil Librarians. And yes I know the cover of the book makes it look old and lame. Synopsis: Alcatraz Smedry is very good at breaking things, you might even say it’s his Talent. As an orphan in the foster system he has been pushed from home to home because through no fault of his own, he breaks things. Everything changes when his real father sends him a birthday present, his grandfather shows up and tells him he is an Oculator (a person with special powers) and that Librarians are actually an organization of evil overlords bent on ruling the world. Recommendation: I would recommend any 5th grader or a 10 year old to read this, depending on their reading level. I does have some killing and death in it, there is conflict and violence. But nothing to worry much about. The protagonist is also in his early teens and has some good internal dialog that felt natural and organic. In some aspects I found it somewhat Animorph-esk, because of all the things that are happening in the world that are covered up by the evil librarians. I love this book. It is quite short and a very easy read. I was finished the whole thing in just a few days. The premise of Oculators which are people who can used special eye glass lenses to do various things is interesting. The Smedry Talents are unique and exiting I don’t want to say too much about things because of spoilers. The most interesting thing about the book from the readers perspective is how it is narrated. Alcatraz is narrating the book from some point in the future. This book is a good learning point to learn about unreliable narrators. He may lie to you, he may insert extra dialog, he may ask the reader to do odd things, but that is the most complex literary element of the book. I must confess that over the last year or two I have become quite the Brandon Sanderson fanboy. This series is one of the last ones for me to read, and as I write this I’ve actually already finished the Alcatraz Series and am in the process of reading it again. Sanderson writes mostly fantasy and sci-fi books, and this was his first book in the Young Adult genre. In conclusion, I love it. I found it very interesting, its different from anything I’ve ever read, and not very difficult. There is no reason why everyone should not read at least this book of the series, and learn to fight back against librarian oppression.